HOOFsmart · Should a Horse’s Hooves be Symmetrical? Why are most horse hooves shaped this way? For one theory, read Dr. Rooney’s article ‘Basic Mechanics of the Digit – Transverse View’. If the text of the article seems a little dense and technical, just skip down to the drawings! Ok, that’s the theory, what about the real world? Dr. Robert Bowker, VMD found that about 80% of the horse hooves he examined as part of a study have the shape predicted by Dr. Rooney’s article – a steeper inside wall and a shallower slope to the outside wall. In a general population of more than 100 feet examined from various breeds and ages, the conformation of the hoof varied considerably from a round foot to one that was flared to one side. Generally, the medial side of the hoof wall was steeper in approximately 80% of the feet examined with the lateral side being slightly flared. In the remainder of the feet examined, the lateral or outside hoof wall was steeper with the medial side being slightly flared. In a few horses (< 5%), the hooves were rounded and exhibited little or no asymmetries. So which equids are likely to have symmetrical hooves? 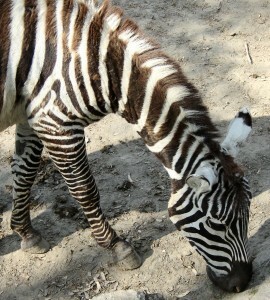 Zebras have very thick, strong, more vertical hoof walls. Zebra hoofprints are U-shaped like a donkey's, not round like a horse's. We could ask the question about horses only, but it’s more fun to include donkeys, mules, and zebras too! They are all equids, members of the family Equidae. Barring abnormalities, equid foals are born with perfectly matching steep, narrow, cylindrical hooves that gradually widen and develop sloping walls as they bear the increasing weight of the growing foal. 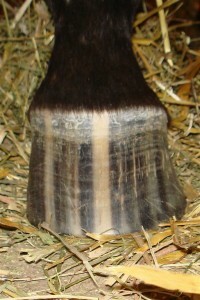 What are some of the factors that may affect the shape of an equid’s hoof as it grows? Smaller horses with a lower adult body weight may tend to retain a steeper, more symmetrical hoof shape with less flaring of the hoof wall: most ponies, including miniature horses, fall into this category. Equids with very thick, strong hoof walls may also retain a steeper, more symmetrical hoof shape with less flaring of the hoof wall: Arabians, Morgans, mustangs, zebras, donkeys, and most mules. Larger horses with a higher adult body weight tend to develop a flatter slope to their hoof walls, particularly draft breeds and pony-sized draft breeds such as the Norwegian Fjord Horse and the Haflinger. Want to read more from the researchers cited in this article?